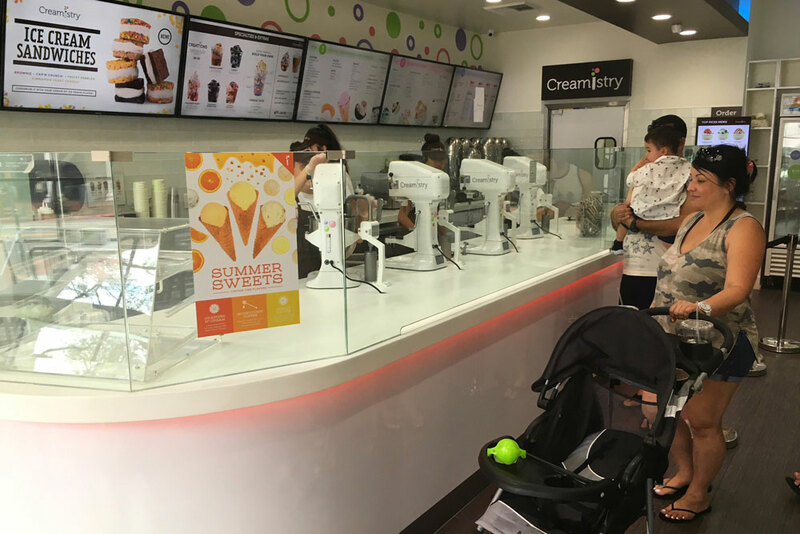 The heat may have brought a brutal summer to Santa Barbara, but fortunately Creamistry has arrived to help cool us off. The ice cream shop at 935 State St. opened at the beginning of July. On Thursday morning, a line began outside the store 15 minutes before the 11:30 a.m. opening. “The first two weeks have been really busy,” said Jason Levi, a self-described "creamologist" at the shop. "It’s been pretty hectic." Creamistry officially marks Santa Barbara's entry into the liquid nitrogen ice cream craze that is sweeping the country. Faced with competition, shop owners are getting creative and converting into boutique ice cream stores. At Creamistry, works inject liquid nitrogren into a liquid mixture of milk, sugar, cream and various flavors. The concoction freezes instantly to create a unique ice cream flavor. "The difference between us and other ice cream stores is, since we flash freeze it with liquid nitrogen, it’s a little bit denser, more creamy and more flavorful," Levi said. Levi said that regular ice cream has about 30 percent air inside it. Levi said his favorite flavor is cotton candy. The shop has 30 flavors and toppings. It offers shakes, floats, and ice cream sandwiches.